June 26 Update: Several astute readers have pointed out that the western portion of our map looked a little, well, funny. It has been decades since some rivers had flows of the magnitude shown, due to dams and diversions. Indeed, our map shows modeled runoff, which represents unimpaired flows, and does not take these developments into account. Here is a new map, where river symbols are proportional to the “gage-adjusted flow,” which takes into account real-world observations. Note the thinning of the Colorado River as it makes its way south, due to withdrawals for cities and farms. Also note the drying of some of the West’s main rivers—long stretches of the Salt, Pecos, Canadian, Rio Grande, and San Joaquin Rivers virtually disappear as their flow drops below 1,000 cfs as a result of withdrawals for human use. 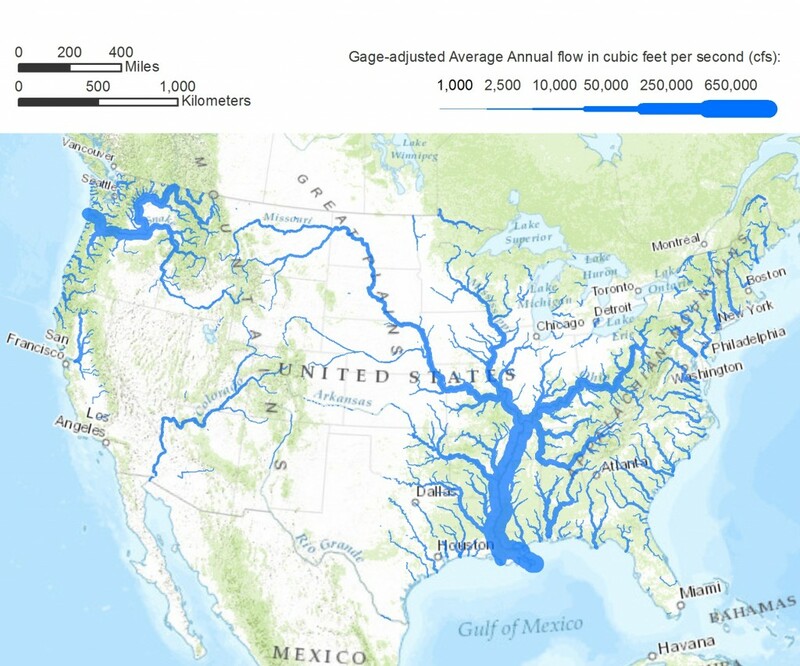 Caption: Major rivers of the 48 contiguous United States, scaled by average flow where river symbols are proportional to the “gage-adjusted flow.” The symbols drawn here have widths proportional to the square root of the rivers’ estimated average annual discharge. Only rivers with discharge above 1,000 cfs are shown. Data from NHDPlus v2. Background map by ESRI. Map projection: Albers equal-area conic. Prepared by Matthew Heberger (2013)*. Full size map here. One of us [Gleick] grew up along the Hudson River on the East Coast, and encountered rivers that seemed to be about the same size: the Susquehanna, the Delaware, the Potomac. Anyone living in the West working on water issues becomes more familiar with the Colorado, the Sacramento, the San Joaquin, and the Rio Grande rivers, but still may have little sense of how much water flows through these different river systems on any given year. Several things stand out: the massive flow of the mighty Mississippi and Columbia River systems; the paucity of major rivers in the western US, especially the southwestern US, where the only major rivers are the seriously over-tapped Colorado and Rio Grande Rivers; and the local importance of the Sacramento-San Joaquin Rivers in California, which serve the state’s cities and agricultural regions. The data for this map come from the National Hydrography Dataset (NHDPlus v2) developed and managed by the US EPA and US Geological Survey, made available to the public and water resources community. And while we share many rivers with our neighbors, this dataset, unfortunately, stops abruptly at the Canadian and Mexican borders. Another extraordinary map created using the same dataset was recently published by Nelson Minar, a Google software engineer. His maps show every river and stream channel identified by the National Hydrography Dataset project, including intermittent and ephemeral rivers that run dry for part or most of the year. The map is a delight to behold, but many of the blue lines represent mostly dry channels. “And you thought the U.S. had deserts!” quipped Popular Science. Now if only you could see the Amazon, whose flow is more than ten times greater than the Mississippi. That would be more than a line on a map. * This work is licensed under a Creative Commons Attribution-NonCommercial-ShareAlike 3.0 Unported License. It would also be useful to see historical flow mapped in these terms, since some of these rivers have lost quite a bit of flow over the years! I love this stuff, but as a western centric water wonk, would want to note that the Sacramento-San Joaquin system (40,000 cfs) carries about twice the flow of the Colorado under natural conditions (20,000 cfs). If as Spreck says the Sacramento-San Joaquin system carries about twice the flow of the Colorado under natural conditions yet looks so small above, no wonder the Delta estuary is in crisis! And I agree with Joanna – seeing a historical perspective would be very eye-opening. Thanks for your thoughtful comments, everyone. This map has generated some really good insights! Spreck, you are correct, and the source data we used reflects the fact that the Sacramento River has a higher average flow than the Colorado at its mouth, but you can’t really see a difference with the map scale and symbology as I set them up. From the photos I’ve seen of the lower Colorado, there is barely a trickle going past the Morelos Dam and flowing into the Gulf of California. To make this map, we used a field in the NHDPlus dataset that represents river runoff based on a statistical hydrologic model. The dataset also includes a “gage-adjusted” flow field, which takes into account real-world observations and would reflect dams, diversions, etc. Looking back, this might have been a better choice. It really depends on the story you’re trying to tell with the map. This one was meant to be a fun way to visualize the lower 48’s rivers based on a new dataset I’d come across. But as several commenters have pointed out, it’s far from perfect. We’ll have to do another map or infographic in a future blog post. Stay tuned! Map has been updated. Check it out!